Description: Made from 600D Polyester. Large main compartment with zippered opening. End pockets with side pouch on right hand side. Available in 2 colours. Features: Zippered front pocket. Bottom board. 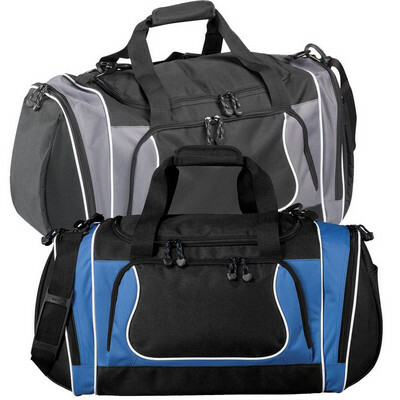 Detachable, adjustable padded shoulder strap and haul handles. No business card holder featured. Packaging: Polybag Colour: Black and Blue with White Trim. Material: 600d pc Product Size: 360mm(h) x 480mm(w) x 330mm(d) Freight details : 12 per carton, 13.6kgs, 50 x 34 x 39cms; Decoration Type(s): Colour Print / Embroider / Full Colour Print Decoration Area: Screen: 80mm(h) x 150mm(w). Embroidery: Centred on front & left side pockets: 120mm Dia, top flap: 150mm Dia, right side pocket: 90mm Dia. Other Methods: Contact your decorator for applicability and size.